NORTH CAROLINA JAYCEES – Service to Humanity is the Best Work of LIfe! Welcome to the North Carolina Jaycees! We believe that service to humanity is the BEST WORK OF LIFE!!! 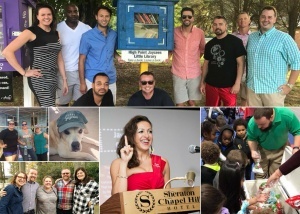 The North Carolina Jaycees give young adults between the ages of 18 and 40 the tools they need to build the bridges of success for themselves and their communities in the areas of business development, individual development, community involvement and international connections. We foster the development of leaders through training, real world experience, community involvement, and the creation of a collaborative network among young adults. We take pride in our global community and are dedicated to leading the positive change needed throughout North Carolina. Partnerships with our state and local governments, North Carolina based businesses and other community organizations are important to us and necessary to move North Carolina forward. Team up with us today and create the relationships needed to strengthen our state by enhancing our local communities and engaging the young people of North Carolina. For over 80 years, Jaycees have been providing development opportunities that empower young people across North Carolina. The North Carolina Junior Chamber provides opportunities for members to improve themselves and use those skills to improve the world around them. By developing friendships AND connections, we create active citizenship. Through active citizenship, we enact our sense of social responsibility to work towards these goals and benefit communities worldwide. The Jaycees provide opportunities for personal growth, leadership development, community involvement, meeting people, and having fun! Every project, every meeting, every experience expands the abilities of Jaycees and presents opportunities and choices.